I have recently been called to the bar in Ontario. 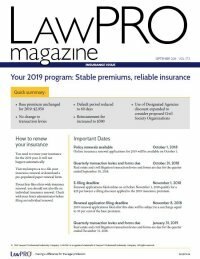 How do I know if I need to purchase the practice coverage under the primary LSO program from LAWPRO? All LAWYERS who are providing PROFESSIONAL SERVICES are mandated by the Law Society of Ontario to the purchase practice coverage under the primary LSO program from LAWPRO. If you are going to practise after your call to the bar, please complete a New Applicant Application form. If you will not be practising immediately after your call, you must complete an Application for Exemption. Please note that you must wait until you receive your LSO number before you can submit your application for insurance or application for exemption form. I was called to the bar earlier this year, and worked at a LAW FIRM for a few months. Can I claim exemption now that I am no longer working? To qualify for an exemption under the primary LSO program, you must be eligible for and maintain your practice coverage for a period of not less than 30 consecutive days. This requirement is pursuant to the LSO program POLICY, Part IV, Condition N (Cancellation and Exemption). In this example, premiums would be owed by you for a period of time after the you left the LAW FIRM to fulfil the 30-day requirement. You may then be eligible to apply for exemption. I was called to the bar this year and plan to restrict my practice to criminal law. I understand that as a new call in my first year I am entitled to a discount equal to 50 per cent of the base premium and am also entitled to similar discount because I am restricting my area of practice to criminal law. Does that mean I get a discount equal to 100 per cent of the base premium this year? No. You would not be entitled to a discount equal to 100 per cent of the base premium, as the maximum combined discount allowed (for the new practitioner discount, the restricted area of practice discount or the part-time discount) is equal to 50 per cent of the base premium. I am a new call and I have been offered a position to work as a law clerk at a LAW FIRM. Do I need to purchase the practice coverage under the primary LSO program? If you are hired to work as a law clerk, legal assistant or other support staff member; are not held out to be acting as a LAWYER to clients or the public (on letterhead or business cards); and are acting under the supervision of an INSURED LAWYER, you may be eligible for exemption. your employer confirms in writing that you have been hired in the capacity of a “non-professional” support staff member (in your case, a law clerk), that you will not be held out to be acting as a LAWYER to clients or the public, and that you will be acting under the supervision of professional staff members. I was called to the Ontario Bar last month, but I practised in a foreign country for many years previously. Am I entitled to discount equal to 50 per cent of the base premium as a new call in Ontario this year? No. Even though you are a recent call in Ontario, you previously practised law for many years in another jurisdiction. The “new call” discount is available to Ontario LAWYERS based upon the whole of their past years in private and/or public practice, regardless of jurisdiction. Although recently called LAWYERS tend to represent a lower risk so are offered this premium discount, those who are new to practice in Ontario but practised in other jurisdictions in the past (whether starting practice in Ontario anew or simply transferring within a LAW FIRM to an office location in Ontario) are often up to speed faster, handling larger and more complex files with commensurate CLAIMS exposure, and perhaps even bringing in clients and files from the past.